NEAR RIVERS – A Brandon couple is embarking on a project of a lifetime — building their very own self-sustaining home, only the second of its kind in Manitoba. Their earth-sheltered home’s design will be similar to an “Earthship,” an idea coined by American architect Michael Reynolds, who built and designed the first Earthship in the early 1970s. Sarah Plosker and her husband Tom Gustin started getting familiar with the idea nearly four years ago while living in an apartment in Guelph, Ont., dreaming of what life could be like if they had more space and lived self-sufficiently. The young couple, originally from Regina, currently live in a 100-year-old home in Brandon and pay high heating bills all winter. Once their new home is complete, which could take up to five years, they will only have an Internet bill to pay. They predict building their dream home, on 10 acres of land in the RM of Daly near Rivers, will cost around $150,000 to $200,000. Although they will be using mainly recycled materials, some of the major costs will include manual labour as well as purchasing a metal roof and windows. A sloped metal roof will allow for harvesting rainwater, while the windows will let in sunlight. “There are people who have done it cheaper by going to dumps and getting the sides of washing machines to do the roof, but the more labour you put into it, the cheaper it is,” Gustin said. 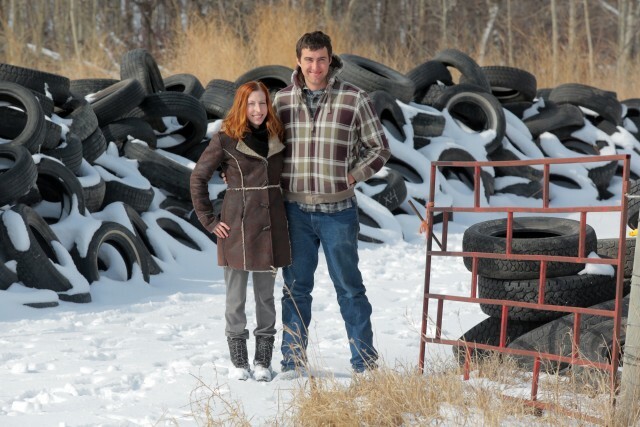 So far they’ve collected nearly 500 old tires, which will be used as the structure’s walls and foundation. Once dirt is pounded into them, they will also serve to hold in the heat. The tires will be stacked one on top of the other and rebar will be used to hold them in place. An indoor wood-burning stove will help keep the home at 16 C year-round. A clay and plaster mixture, along with glass bottles, will be used for the inside walls. They also plan to build a greenhouse and a natural outdoor swimming pool on their property. While securing their building permit, which was a two-year process to obtain, the couple hired Winnipeg-based architect Pádraic O’Connell to help them with the design. O’Connell said that although he has worked on various sustainable building projects in the past, they’ve never been of this magnitude. Earthships seem to be slowly gaining momentum across Manitoba. One has been built just outside Winnipeg, while other people are showing interest on the “Manitoba Earthships” Facebook page, which now has nearly 1,400 members. Through his own research, Gustin has come across about 60 Earthships that have been built across Canada. O’Connell said he believes increased climate change awareness is getting more people on board. Plosker and her husband are now looking for a crew of volunteers to help with the build, which they hope to start as soon as the snow melts. Those interested in helping can contact Plosker via email at sarah.plosker@gmail.com. “Self-grown produce … that’s definitely one thing we’re excited about,” Gustin added.